As with speech, there are several aspects to the human auditory system as well as several pieces of remarkable 'hardware' and 'software' that together endow us with the ability to hear. These aspects include the physical sound waves that travel through the air and which can be picked up and analysed by digital computer hardware (or generated by computer), as well as the interpretation of those signals by the human brain. The difference between what we perceive and what is pysically present is due in part to the 'hardware' limitations, such as the frequency response of the outer ear, but also to the brain processing that is our 'software'. That level of hearing is usually studied as part of the fascinating topic of psychoacoustics (which is the subject of Chapter 5). Probably the most important and interesting part of this is within the inner ear, the cochlea. 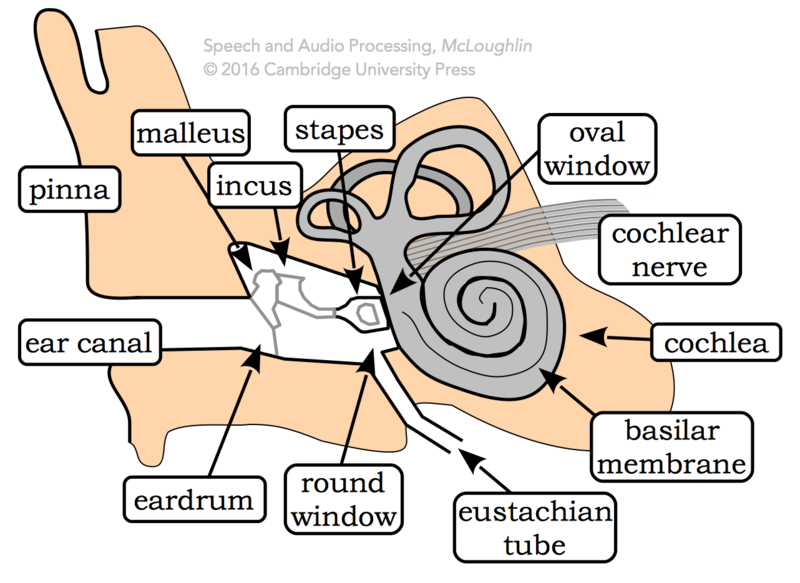 Within the cochlea, the basilar membrane and the hair cells that are hosted there are the parts of the ear that are sensitive to sounds. As described within the book, it is the vibration of the hair cells in response to rarefactions or compressions of the fluid in the inner ear that gives rise to nerve signals and subsequently to the sensation of hearing. An excellent resource that describes this hardware in some detail is at www.cochlea.ea, which even shows electron microscopy of the cochlea and hair ceslls. Another source of useful background information is wikipedia. Can you hear the difference between these tones? Incidentally, most of our human senses are more sensitive to changes than they are to steady state, absolute, conditions. This is true of motion, sight, touch, taste, temperature. In fact I would argue it is also true of emotions - anger, love, happiness, sadness and so on.